A Punto is a cooking school, a book shop specialized in cook books and a place where people come to learn about gastronomy and wine. A Punto was born from the desire of its three partners to make Madrid the place where gastronomic culture could have his spreading. Sara Cucala and Ana Lorente, reknown gastronomic journalists, are running the centre and offer their professional knowledge to create the courses. Roberta Bruno, marketing manager and wine sommelier focuses on the international part of the business. The idea came from visiting book shops all over the world and turned into a cultural centre of tasting with cooking lessons, wine tastings, conferences and the newly created gastronomic tours. The pioneering initiative of the gastronomic tours in the neighborhoods of Salamanca district stem from the aim to let people know that not only the historical centre of Madrid is full of gastronomic activities. The whole A Punto space (bookshop, tasting room and two kitchen) is open to the development of cultural activities linked to the world of literature and gastronomy. Two kitchens for hands on cooking classes for a maximum of 50 people. 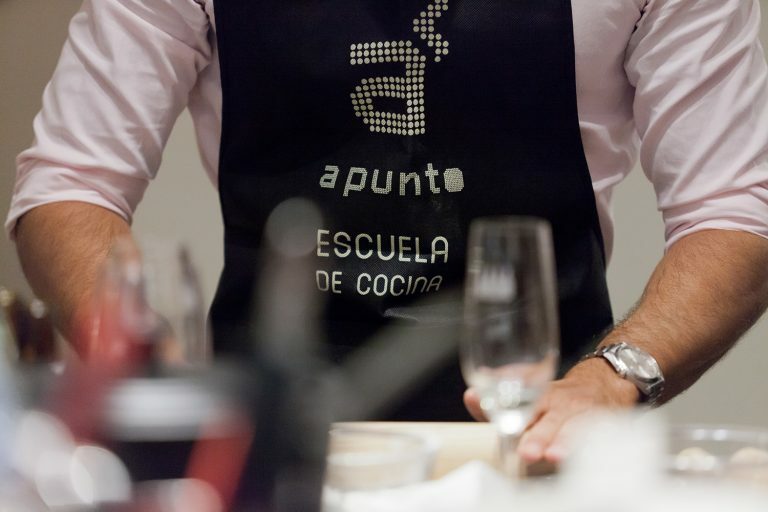 With our daily program of cooking classes in A punto we count on the experience of some of the most reknown chefs of Madrid for an authentic Spanish cooking class. We can start with a market tour to discover all our products and then come back to A Punto to cook them all together. In each course you receive a dossier with recipes in English for you to practice at home. You can enjoy our private hands-on cooking class with our English, French or German speaking chefs. A cozy space where we arrange multiple tastings of wine, beer, spices etc with the supervision of Ana Lorente for a maximum of 35 people. With more than 6000 titles in Spanish and English, at A Punto one can find theory and practice of master chefs and the traditional and innovative use of a variety of ingredients and recipes. A Punto organizes tours every week around the most important districts of Madrid and its neighborhoods with the idea to let visitors discover Madrid’s gastronomic offer.